This product requires the base game Talisman: The Horus Heresy - Season Pass. 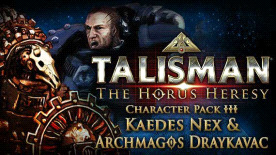 The third character expansion pack for Talisman: The Horus Heresy includes two powerful Warlords of the civil war - Kaedes Nex and Archmagos Draykavac. Each Warlord also comes with their custom Legion Dataslates, plus 15 new Encounter Dataslates. ILL-OMENED - He May NOT use his Strategy when trying to reunite with a friendly Unit. RELENTLESS STALKER - Whenever he defeats an enemy Unit in combat and gains XP, he also gains +2 XP for each Unit he defeated. This does not apply to defeating Warlords or Horus. Whenever he defeats a Warlord in combat and takes resolve from them, he also gains 5 XP. The treacherous Archmagos Draykavac has a fearsome reputation throughout the Imperium, thinking nothing of sacrificing thousands of lives to further his knowledge and understanding of the arcane arts of the Omnissiah.When the Horus Heresy broke out, Draykavac revealed his dark allegiance to Warmaster Horus, his loyalty bought with the promise of access to technologies long forbidden by the Emperor. ARCHMAGOS PRIME - He may attempt to Reunite with ANY Traitor – Mechanicum Unit [Reunite 5+]. FORBIDDEN SACRIFICE - When he defeats a Loyalist – Mechanicum Unit in a Firefight, he may capture the Unit instead of gaining XP. He may take one captured unit, and if it is a ranged combat enemy, add its Ranged Combat to his for one Firefight Engagement, after which it is destroyed. He may only use on Captured Unit per Firefight. Whenever he visits a Forge World, he may discard one of his Captured close combat Units and replace it with an Equipment Dataslate from the Forge World. Talisman: The Horus Heresy (c) Copyright Games Workshop Limited 2016. The Talisman: The Horus Heresy logo, Talisman, the Talisman logo, The Horus Heresy Eye logo, GW, Games Workshop, Space Marine, 40k, Warhammer, Warhammer 40,000, 40,000, the 'Aquila' Double-headed Eagle logo, and all associated logos, illustrations, images, names, creatures, races, vehicles, locations, weapons, characters, and the distinctive likeness thereof, are either (r) or TM, and/or (c) Games Workshop Limited, variably registered around the world, and used under licence. Nomad Games is the registered trademark of Nomad Games Limited. All Rights Reserved to their respective owners.